Robert Hannaford has now been in the Archibald Prize 21 times, winning the People’s Choice Award on three occasions. In 2007, he was represented by a self-portrait that pictured him in his studio at the end of a program of chemotherapy and radiotherapy. One of the first paintings he did during his recovery from throat cancer, he depicted himself naked in order to show the feeding tube into which liquid food was injected seven times a day. This self-portrait shows him in the same studio, in the same light – but looking very much healthier. According to Hannaford: “there’s not much more to say” about the painting. Born in 1944, Hannaford lives and works as a full-time artist in Riverton, South Australia. 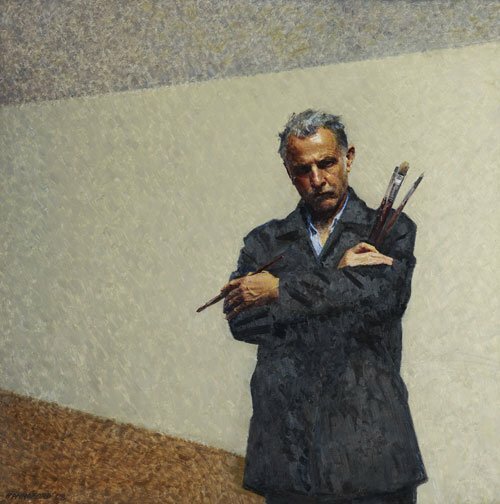 He won the Doug Moran National Portrait Prize in 1990 and the inaugural Fleurieu Landscape Prize in 1998. His sculpture of Sir Donald Bradman stands outside the Adelaide Oval. He has been commissioned to paint many well known figures, among them Paul Keating and Dame Joan Sutherland. In 2001, he was awarded his most challenging commission: to paint the centenary of Federation commemorative sitting of the Commonwealth Parliament held in Melbourne. The vast composition took over a year to complete.